Silver-tongued SpongeBob can charm his way out of nearly any situation, whether it’s failing his driving test to forgetting to serve the cross customers at the Krusty Krab! Now he’s going to let YOU in on his secrets. Fill in the blanks and see just how he does it. Learn his top ten excuses for not doing homework and being late. Whether your homework’s been eaten by Nematodes or you’ve spilt sea onion sundae on your school uniform – no fuss! Let SpongeBob talk you out of trouble with an undersea excuse! 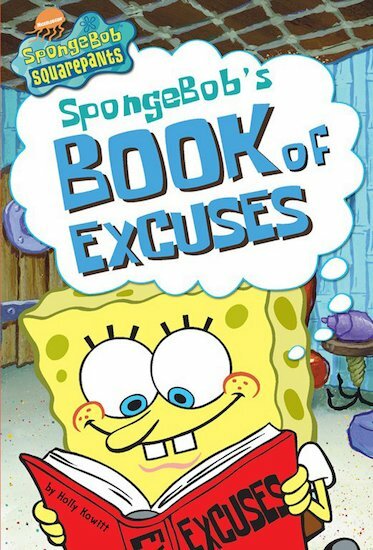 spongebobs book of excuses is really funny with really funny excuses and jokes like mrs puff:Spongebob why dont you get as and bs Spongeob:I want to be a sea student.